Devils celebrate. Pic: Helen Brabon. 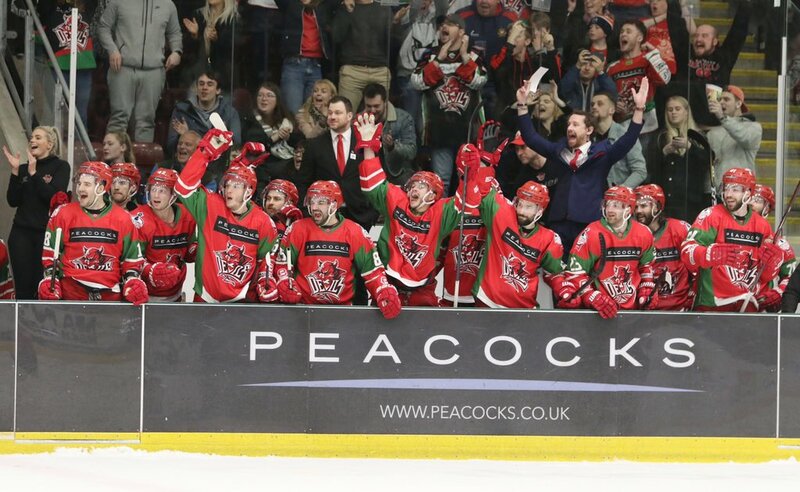 Joey Martin led Cardiff Devils to victory on a dramatic and emotional night at the Viola Arena in Cardiff Bay. Canadian playmaker Martin took his goals tally for the season to 33 with a hat-trick which ended Sheffield Steelers challenge in the Elite League Predictorbet play-offs. It was an intense, physical battle and at one stage went ahead on aggregate during the final period, but Devils held their nerve to qualify for the finals weekend. They will play Nottingham Panthers in the semi-finals, while Belfast Giants take on Guildford Flames. A sell-out attendance at the Viola created an amazing, incredibly noisy atmosphere and home fans somehow became even louder with their support when Devils slipped behind on aggregate. Steelers earned a 5-4 in the first leg of their quarter-final against Devils which was shown live on Freesports television. Martin (3), Sean Bentivoglio, Mark Richardson, Layne Ulmer and Matthew Myers scored for Devils on a night which will rank among the best at their home arena. Devils were rocked when Steelers hit back from 3-1 down on the night to level the scores at 3-3 and edge ahead on aggregate. Eric Neiley scored 26 seconds into the final period and then Jordan Owens scored at 41-13 to stun Home fans and give Steelers the overall lead at 8-7. Devils though responded with four goals in the final ten and a half minutes. Layne Ulmer scored at 49-40 on the powerplay, while Matthew Myers’ pass across the face of the goal somehow squirmed between goalie Jackson Whistle’s pads and into the net 39 seconds later. The goal was reviewed for possible goaltender interference and awarded. Martin moved Devils two ahead on aggregate when he pounced on a rebound at 53-21 and the Canadian forward then completed his hat-trick by scoring an empty net goal with three seconds left to complete a 7-3 win on the night. Devils v Panthers will be the second semi-final at the play-off fans weekend in Nottingham. Giants v Flames will face-off at 1pm with Devils v Panthers starting at 5pm. Cardiff Devils’ Matthew Myers. Pic: Helen Brabon. The winners will clash in the final on Sunday (4pm), while the losers will compete in the 3rd v 4th place play-off (Noon). Scorers, Devils: Sean Bentivoglio 1+1, Joey Martin 3+1, Mark Richardson 1+1, Layne Ulmer 1+0, Matthew Myers 1+1, Bryce Reddick 0+1, Evan Mosey 0+1, Charles Linglet 0+2, Stephen Dixon 0+1, Gleason Fournier 0+1, Jake Morissette 0+1, Mark Louis 0+1, Mike Hadden 0+1, Bryce Reddick 0+1. Steelers: Jordan Owens 2+0, Eric Neily 2+0, John Armstrong 0+1, Josh Pitt 0+1, Tanner Eberle 0+1, Ben O’Connor 0+1. Period scores (Devils first) 2-0; 1-1 (3-1); 4-2 (7-3). Shots on goal: Devils (on Whistle) 17+14+11=42; Steelers 13+10+14=37. Penalties in minutes: Devils 2+4+4=10; Steelers 2+6+4=12. Special teams: Devils PK 5/5, PP 2/6; Steelers PK 4/6; PP 0/5. Men of the match: Devils, Joey Martin; Steelers, Jordan Owens. Predictorbets play-off quarter-finals, second leg and aggregate results: Nottingham Panthers 3, Fife Flyers 0 (Panthers won 6-3 on aggregate); Coventry Blaze 2, Belfast Giants 7 (Giants won 12-2 on aggregate); Cardiff Devils 7 Sheffield Steelers 3 (Devils won 11-8 on aggregate); Glasgow Clan 0, Guildford Flames 5 (Flames won 7-3 on aggregate).